Hamstring strains are caused by a rapid extensive contraction or a violent stretch of the hamstring muscle group which causes a high mechanical stress. This results in varying degrees of rupture within the fibres of the musculotendinous unit. Hamstring strains are common in sports with a dynamic character like sprinting, jumping,contact sports such as Australian Rules football (AFL), American football and soccer where quick eccentric contractions are regular. In soccer it is the most frequent injury..Hamstring injuries can also occur in recreational sports such as water-skiing and bull riding, where the knee is forcefully fully extended during injury. The cause of a hamstring muscle strain is often obscure. In the second half of swing phase, the hamstrings are at their greatest length and at this moment, they generate maximum tension  . In this phase, hamstrings contract eccentrically to decelerate flexion of the hip and extension of the lower leg . At this point, a peak is reached in the activity of the muscle spindles in the hamstrings. A strong contraction of the hamstring and relaxation of the quadriceps is needed. According to “Klafs and Arnheim”, a breakdown in the coordination between these opposite muscles can be a cause for the hamstring to tear.The greatest musculotendon stretch is incurred by the biceps femoris,which may contribute to its tendency to be more often injured than the other 2 hamstring muscles (semimembranosus and semitendinosus) during high-speed running. previously associated lumbar spine abnormalities.Kicking and executing abdominal strengthening exercises with straight legs have been identified as possible contributory causes of lordosis. The anatomical reason seems to be that the iliopsoas muscle group is primarily involved in kicking and straight leg raising or straight leg sit-up exercises and contributes to strengthening this muscle'. Therefore, it is possible that certain athletic activities and training methods which exacerbate postural defects may also predispose the player to injury. Another debate is on hamstring variation in muscle architecture.Short head of biceps femoris(BFS) possess longer fascicles (which allow for greater muscle extensibility and reduce the risk of over lengthening during eccentric contraction) and a much smaller cross section area compared to Long head of biceps femoris(BFL). Whereas BFL presents with shorter fascicles compared to BFS which undergo repetitive over lengthening and accumulated muscle damage. 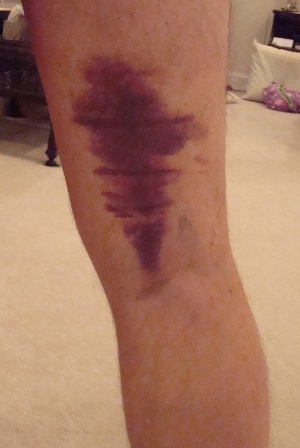 Hamstring strain results in a sudden, minimal to severe pain in the posterior thigh. Also a "popping" or tearing impression can be described. Sometimes swelling and ecchymosis are possible but they may be delayed for several days after the injury occurs. Rarely symptoms are numbness, tingling and distal extremity weakness. These symptoms require a further investigation into sciatic nerve irritation. Large hematoma or scar tissue can be caused by complete tears and avulsion injuries. Hamstring strains are categorised in 3 groups, according to the amount of pain,weakness,and loss of motion. On examining the patient, the physiotherapist possibly has to differentiate between different injuries e.g. adductor strains, avulsion injury, lumbosacral referred pain syndrome, piriformis syndrome, sacroiliac dysfunction, sciatica, Hamstring tendinitis and ischial bursitis. Other sources of posterior thigh pain could also be confused with hamstring strains and should be considered during the examination process. Specific tests and imaging are used to asses and exclude those different pain source possibilities. Sciatic nerve mobility limitations can contribute to posterior thigh pain and adverse neural tension could in some cases be the only source of pain without any particular muscular injury. In certain cases it is difficult to determinate whether it are the Hamstrings or other muscle groups like hip adductors (eg. M. Gracilis and M. Adductour magnus and longus.) that are injured due to their proximity. Sometimes imaging procedures may be required to determinate the exact location of the injury. Most of the acute injuries can easily be found by letting the patient tell how the injury occured. To be sure they must do a little investigation of the hamstrings as well. When the therapist Isn't too sure, he can ask for medical imaging. This will exclude all other possibilities. Radiographs: a good thing about radiographs is that with that kind of imaging, its possible to differentiate the etiology of the pain. It can differentiate in muscular disease (e.g muscle strain) or a disease of the bone (e.g. Stress fracture). MRI study was done to distinguish between two main groups of muscle injuries: Injury by Direct or Indirect trauma. Within the group of injuries due to indirect trauma, the classification brings the concept of functional and structural lesions. Functional muscle injuries present alterations without macroscopic evidence of fiber tear. These lesions have multifactorial causes and are grouped into subgroups that reflect their clinical origin, such as overload or neuromuscular disorders. Structural muscle injuries are those whose MRI study presents macroscopic evidence of fiber tear, i.e., structural damage. They are usually located in the Musculotendinous junction, as these areas have biomechanical weak points. FASH: The FASH(Functional assessment scale for acute Hamstring injuries) questionnaire is a self-administered questionnaire which now can only be used in Greek, English and German languages. Because hamstring injuries represent the most common football injury, they tested the validity and reliability of the FASH-G (G = German version) questionnaire in German-speaking footballers suffering from acute hamstring injuries. The FASH-G is a valid and reliable instrument to assess and determine the severity of hamstring injuries in a population of athletes. SFMA: The Selective Functional Movement Assessment (SFMA) is a clinical assessment system designed to identify musculoskeletal dysfunction by evaluation of fundamental movements for limitations or symptom provocation. Running gait: The physical examination begins with an examination of the running gait. Patients with a hamstring strain usually show a shortened walking gait. Swelling and ecchymosis aren’t always detectable at the initial stage of the injury because they often appear several days after the initial injury. Observation: The physical examination also exists of visible examination. The posterior thigh is inspected for asymmetry, swelling, ecchymosis and deformity. Palpation: Palpation of the posterior thigh is useful for identifying the specific region injured through pain provocation, as well as determining the presence/absence of a palpable defect in the musculotendon unit. With the patient positioned prone, repeated knee flexion-extension movements without resistance through a small range of motion may assist in identifying the location of the individual hamstring muscles and tendons. With the knee maintained in full extension, the point of maximum pain with palpation can be determined and located relative to the ischial tuberosity, in addition to measuring the total length of the painful region. The total length, width and the distance between ischial tuberosity and the area with maximal pain are measured in centemeters .While both of these measures are used, only the location of the point of maximum pain (relative to the ischial tuberosity) is associated with the convalescent period. That is, the more proximal the site of maximum pain, the greater the time needed to return to pre-injury level.The proximity to the ischial tuberosity is believed to reflect the extent of involvement of the proximal tendon of the injured muscle, and therefore a greater recovery period. Range of motion :Range of motion tests should consider both the hip and knee joints. Passive straight leg raise (hip) and active knee extension test (knee) are commonly used in succession to estimate hamstring flexibility and maximum length.Typical hamstring length should allow the hip to flex 80° during the passive straight leg raise and the knee to extend to 20° on the active knee extension test.61 When assessing post-injury muscle length, the extent of joint motion available should be based on the onset of discomfort or stiffness reported by the patient. In the acutely injured athlete, these tests are often limited by pain and thus may not provide an accurate assessment of musculotendon extensibility. Once again, a bilateral comparison is recommended. Hip flexibility :The hip flexion test combined a passive unilateral straight leg raise test (SLR) with pain estimation according to the Borg CR-10 scale. The sprinters were placed supine with the pelvis and contralateral leg fixed with straps. A standard flexometer was placed 10 cm cranial to the base of the patella. The foot was plantar flexed and the investigator slowly(approximately 30 degree) raised the leg with the knee straight until the subject estimated a 3 (“moderate pain”) on the Borg CR-10 scale (0 = no pain and 10 = maximal pain). The hip flexion angle at this point was recorded, and the greatest angle of three repetitions was taken as the test result for Range of Motion (ROM). Values of the injured leg were expressed as a percentage of the uninjured leg for comparisons within and between groups. No warm-up preceded the flexibility measurements. Knee flexion strength : Isometric knee flexion strength was measured with the sprinter in a prone position and the pelvis and the contralateral leg fixed.A dynamometer was placed at the ankle, perpendicular to the lower leg. The foot was in plantar flexion and the knee in an extended position. Three maximal voluntary isometric knee flexion contractions were performed, each with gradually increasing effort. Each contraction lasted 3 s with 30 s of rest in-between. The highest force value was taken as the test result for strength.Attempts to bias the medial or lateral hamstrings by internal or external rotation of the lower leg, respectively, during strength testing may assist in the determination of the involved muscles. LR : Likelihood ratios permit the best use of clinical test results to establish diagnoses for the individual patient. Surgical intervention is an extremely rare procedure after a hamstring strain. Only in case of a complete rupture of the hamstrings, surgery is recommended. Almost all patients believed that they had improved with surgery. A study  shows that 91% was satisfied after surgery and rated their happiness with 75% or better. Hamstrings endurance tests and hamstring strength tests were better and highly scored after an surgical procedure. The muscle strength testing after surgery ranged from 45% until 88%. The hamstrings endurance testing ranged from 26% to 100% .The physical examination and follow-up reveals that all repairs stayed intact. The primary objective of physical therapy and the rehabilitation program is to restore the patient’s functions to the highest possible degree and/or to return the athlete to sport at the former level of performance and this with minimal risk of reinjury. Hamstring strain injuries remain a challenge for both athletes and clinicians, given their high incidence rate, slow healing, and persistent symptoms. Moreover, nearly one third of these injuries recur within the first year following a return to sport, with subsequent injuries often being more severe than the original. (LoE = 5) The use of a specific and adequate training programme to rehabilitate hamstring strains can be determinant for the healing and prevention of a recurrent hamstrings strain injury. Different kind of therapies are used to rehabilitate hamstring strains, but are they all as effective enough to prevent a recur within the first year following a return to sport? Different studies tried to show the impact of eccentric exercises, dry needling, deep stripping massage, etc. on hamstring strain rehabilitation. The impact of kinesiology tape has been demonstrated to be efficient on the improving of muscle flexibility, which can prevent or improve the risk of having injuries. (LoE = 2B) Kinesiology tape can be used in combination of other rehabilitation programmes to improve the muscle flexibility. There are lots of techniques and programmes that can be used for the revalidation of hamstring strains injuries but due to a lack of studies, the effectiveness of these techniques can not all been demonstrated. Therefore eccentric exercises are the most known and applied programme for the rehabilitation of hamstring strains injuries. The use of this kind of programme has shown good results. One common criticism of rehabilitation programs that emphasize eccentric strength training, is the lack of attention to musculature adjacent to the hamstrings. It has been suggested that neuromuscular control of the lumbopelvic region is needed to enable optimal function of the hamstrings during normal sporting activities. Pain-free isometric contracton against submaximal (50%-75%) resistance during prone knee flexion at 90. Isokinetic strength testing should be performed under both concentric and eccentric action conditions. Less than a 5% bilateral deficit should exist in the ratio of eccentric hamstring strength (30d/s) to concentric quadriceps strength (240d/s). ↑ 1.0 1.1 Sutton G. Hamstrung by hamstring strains: a review of the literature*.J Orthop Sports Phys Ther. 1984; 5(4):184-95. ↑ Schunke M., Schulte E., Schumacher. Anatomische atlas Prometheus: Algemene anatomie en bewegingsapparaat. Nederland: Bohn Stafleu Van Loghum, 2005. ↑ 6.0 6.1 6.2 Heiderscheit BC, Sherry MA, Silder A, Chumanov ES, Thelen DG. Hamstring strain injuries: recommendations for diagnosis, rehabilitation, and injury prevention. journal of orthopaedic & sports physical therapy. 2010 Feb;40(2):67-81. ↑ 7.0 7.1 Opar MD, Williams MD, Shield AJ. Hamstring strain injuries. Sports medicine; 2012: 1;42(3):209-26. ↑ Prior M, Guerin M, Grimmer K. An evidence-based approach to hamstring strain injury: a systematic review of the literature. Sports health. 2009 Jan;1(2):154-64. ↑ Hennessey L, Watson AW. Flexibility and posture assessment in relation to hamstring injury. British Journal of Sports Medicine. 1993 Dec 1;27(4):243-6. ↑ 12.0 12.1 12.2 12.3 12.4 Heiderscheit BC, Sherry MA, Silder A, Chumanov ES, Thelen DG. Hamstring strain injuries: recommendations for diagnosis, rehabilitation, and injury prevention. journal of orthopaedic & sports physical therapy. 2010 Feb;40(2):67-81. ↑ Ernlund L, Vieira LD. Hamstring injuries: update article. Revista brasileira de ortopedia. 2017 Aug;52(4):373-82. ↑ Malliaropoulos N, Korakakis V, Christodoulou D,Padhiar N, Pyne D, Giakas G et al. Development and validation of a questionnaire (FASH--Functional Assessment Scale for Acute Hamstring Injuries): to measure the severity and impact of symptoms on function and sports ability in patients with acute hamstring injuries. Br J Sports Med. 2014: 48:1607-12. ↑ Glaws, Kathryn R.; Juneau, Christopher M.; Becker, Lindsay C et al. Intra- and inter-rater reliability of the selective functional movement assessment (sfma). International Journal of Sports Physical Therapy 2014: 9:195-207.